Joseph McCarthy (1908-1957) was an American lawyer and politician, famous for instigating and leading witch hunts against suspected communists in the 1950s. McCarthy was born in rural Wisconsin, the fifth of nine children to Irish working-class parents. He dropped out of school aged 14 to work on his father’s farm, then for a time managed a grocery store. McCarthy returned to high school at age 20 and graduated as an adult. He began an engineering degree at college before switching to law and obtaining his degree in 1935. He struggled to make a living from the law so supplemented his income by playing poker. McCarthy had his mind set on a career in politics, so chose his jobs accordingly. He lobbied unsuccessfully to become a district attorney, before becoming Wisconsin’s youngest judge at age 30. His contemporaries describe McCarthy as a fast-moving, no-nonsense judge, not fond of overseeing long cases or delivering wordy judgements. Within four years he had obtained a position as a circuit judge, where he became famous for dealing with cases quickly, some in a matter of minutes. In 1942 McCarthy volunteered for the US Marines and served in the Pacific theatre of World War II, chiefly as an instructor. In 1946 McCarthy stood as a Republican candidate for the US Senate. 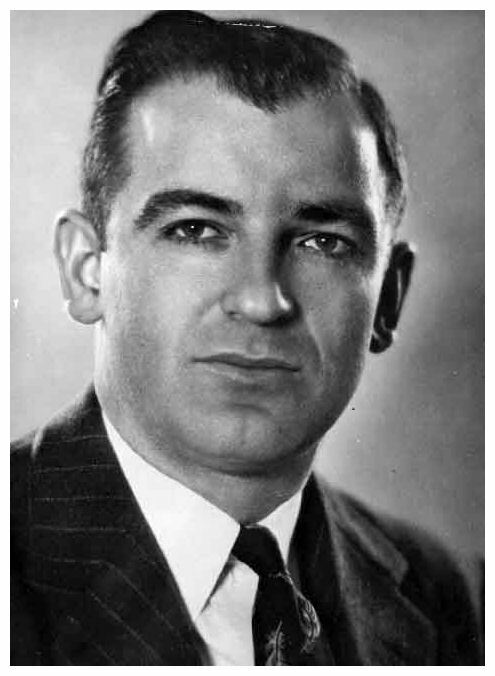 His campaign featured relentless and often scurrilous attacks on his opponents, as well as exaggerated and dishonest claims about McCarthy’s war service. Despite this, McCarthy was elected and at age 38 became the youngest sitting member of the US Senate. His first three years in Congress were remarkable only for McCarthy’s inflammatory remarks and frequent disregard for Senate rules and conventions. In 1949 a group of political journalists voted McCarthy the “worst senator currently in office”, while fellow senators found him stubborn, hot-tempered, aggressive and thoroughly unlikeable. There were also reports from his first years in the Senate that McCarthy was an alcoholic: he rarely missed social functions and was often seen drinking in his Senate office. McCarthy’s rise to public attention began in February 1950, when he delivered a speech to a women’s Republican group in Wheeling, West Virginia. 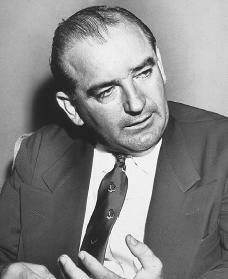 In his Wheeling address McCarthy claimed to hold details of communists working for the State Department. “The State Department is infested with communists”, he told his enthralled listeners. “I have here in my hand a list of 205 names that were known to the Secretary of State as being members of the Communist Party, who nevertheless are still working and shaping policy”. McCarthy did not provide or publish details of his list, in fact, it is unlikely he had such a list. In the paranoid milieu of the early Cold War, however, McCarthy’s claims kickstarted a wave of rumours, accusations and investigations. The Wheeling address is considered the starting point for what became known as ‘McCarthyism‘: an anti-communist witch hunt that quickly broke its banks and led to countless individuals being unfairly accused and persecuted. Buoyed by his increased public profile, McCarthy began to accuse government agencies and individual politicians, diplomats and bureaucrats of being sympathetic to or soft on communism. These attacks were extended to the highest levels of government, including former Secretary of State George C. Marshall and President Truman himself. Truman said little about McCarthy or his claims in public but privately described the Wisconsin senator as a “pathological liar”. McCarthy’s eventual downfall came in 1954.In March that year, the respected American broadcaster Edward R. Murrow delivered a scathing editorial on McCarthy, accusing him of exploiting Cold War paranoia for his own personal advantage. 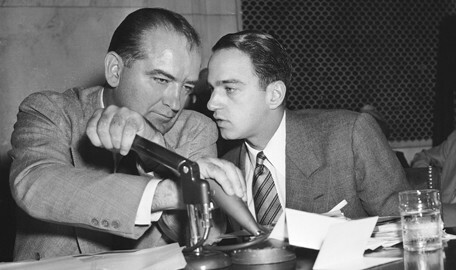 The following month McCarthy and his chief counsel, Roy Cohn, instigated and oversaw hearings into alleged communist sympathisers in the US Army. These hearings, which were televised live, exposed McCarthy’s bullish interrogations and Cohn’s personal agenda. With his tactics known to a wider audience, McCarthy became subject to greater criticism and accountability. In December 1954 the US Senate voted to censure McCarthy for “acting contrary to senatorial ethics and tended to bring the Senate into dishonour and disrepute”. McCarthy had faded from prominence by mid-1955. He remained in the Senate for a further two years, continuing to rage and fume about alleged communists in the government and its agencies. McCarthy died in 1957, aged just 48, from a liver condition caused by his alcoholism. His funeral in Washington was attended by 2,000 mourners and dozens of his fellow senators. J. Llewellyn et al, “Joseph McCarthy”, Alpha History, accessed [today’s date], https://alphahistory.com/coldwar/joseph-mccarthy/.